Fine marine art for sea people by Gordon Frickers, enjoy! Commissioned by Tracy Edwards as a royal gift for her principal sponsor. A typically timeless painting, the test of true greatness/classics, the of best long term fine art investments. Thinking of commissioning something special that you love? Ask for a chat with Gordon Frickers ~ gordon at frickers.co.uk or call T:+ 44 (0)1865 52 2435 or use Skype. Hyperlink to > “Roaring Forties” commissioned, available as a signed print. 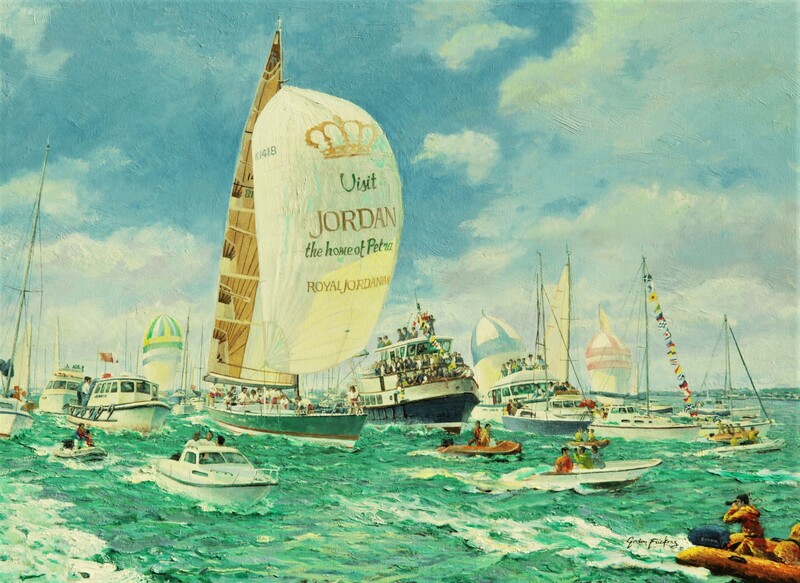 “I would love another Frickers painting“~ Britain’s most famous living sailor, Sir Robin Knox-Johnston. Robin has often been interviewed choosing this iconic painting in the background. 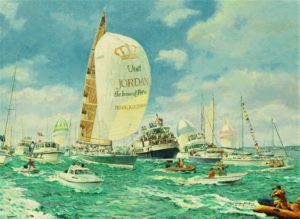 Sir Robin Knox-Johnston went on to commission 2 other Frickers paintings, ‘The Clipper Way’ and ‘Dumra Departing Bombay’. Further Reading: useful facts + excellent stories about Yachts and Superyachts. A highly experienced marine artist Gordon Frickers has some famous paintings to his credit in particular the memorable “Roaring Forties”. “Many thanks for producing a truly beautiful painting” ~ Alison Bushell, Client Manager, Devonport Royal Dockyard Ltd. This painting is in the members lounge, Royal Plymouth Corinthian Yacht Club. Ice Maiden Sold, only 2 prints left still in stock & available. 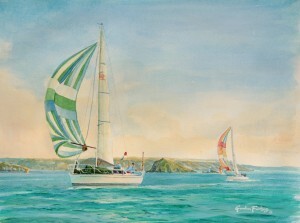 Swans at Guernsey commissioned by Yachting World, sold. Yamaha “First Challenge – First Victory” commissioned for Yamaha,sold. King of Hearts commissioned, sold. 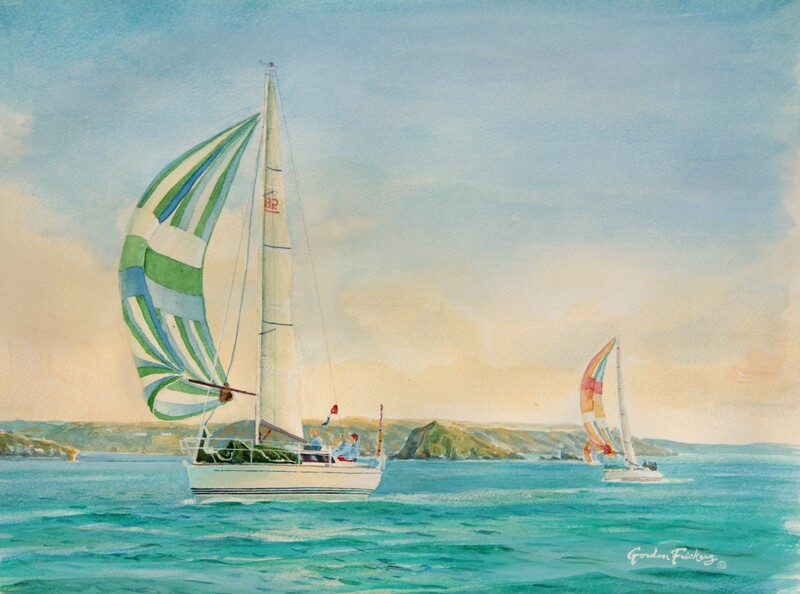 Marine Art Commissions, Gordon Frickers is widely considered to be one of the very best marine artists, painters today, observant, meticulous, reliable. 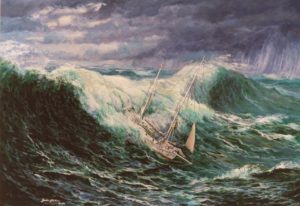 Gordon Frickers has examples of his marine art in National collections in England and France. Recent clients included several super yacht builders, also owners, the Ministry of Defense and the government of Oman. Gordon Frickers is a member of the British Marine Federation and Superyacht UK. Ben Ainslie THE amazing Olympic silver medallist (1996) & gold (2000 & 4 & 8) wrote, “I’m quite sure the painting will be brilliant“. Gordon Frickers is honoured to be the only artist invited to exhibit at the European Parliament, Brussels (May 2011). Official Artist to HMS Victory 1993 to 1998. 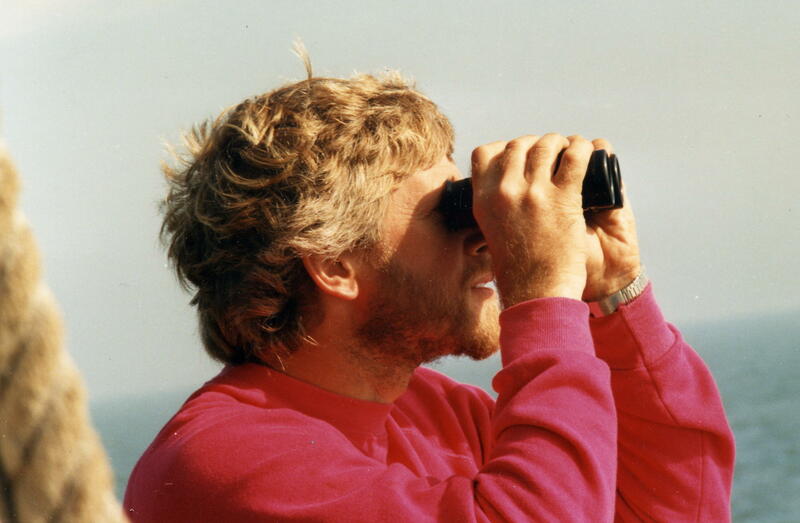 He is the only member of The British Marine Federation, The Marine Trades Association and Superyacht UK. He was noted in Superyacht Business, “the Best of British 2009”, Debretts, Wikipedia and many other places. You could own one of Gordon Frickers remarkable marine paintings, don’t miss your chance, contact us. Would you like to acquire or commission a painting of this quality? Phone or email us, now before you forget ! Be inspired and inspiring, enjoy your time here.